Brain & Memory Power Boost supports optimal brain and memory revitalization. Do you want a healthier memory? More cognitive clarity? Mental focus? To feel sharper? Then, Dr. Daniel Amen’s Brain and Memory Power Boost may be for you. Clinical neuroscientist, board certified psychiatrist, and brain imaging expert Dr. Daniel Amen has designed a revolutionary new approach to helping restore and support healthy brain function. Brain and Memory Power Boost includes the super-antioxidant N-Acetyl-Cysteine (NAC), along with phosphatidylserine to maintain the integrity of cell membranes and huperzine A and Acetyl-l-Carnitine (ALC) to enhance acetylcholine availability and vinpocetine and gingko biloba to enhance blood flow. This is a novel combination of powerful antioxidants and nutrients essential in enhancing and protecting brain health. Dr. Daniel Amen’s Brain and Memory Power Boost supports overall brain health, circulation, memory and concentration. 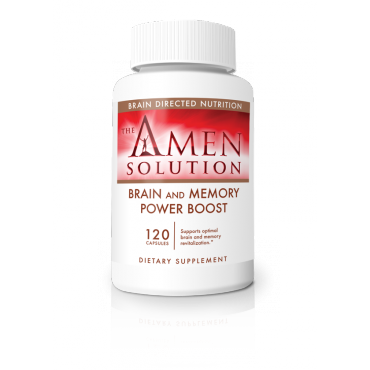 As a dietary supplement, take four capsules of Dr.Amen’s Brain and Memory Power daily with meals or as directed by your healthcare professional. This must be taken with meals to ensure the highest absorption rate of vinpocetine. This product contains NO milk/dairy, artificial coloring or flavoring. (DUE TO CANADIAN AND SWEDISH CUSTOMS RESTRICTIONS THIS PRODUCT IS NOT CURRENTLY AVAILABLE TO SHIP TO CANADA OR SWEDEN) STORE IN A COOL, DRY PLACE. KEEP OUT OF REACH OF CHILDREN. These statements have not been evaluated by the Food and Drug Administration. This product is not intended to diagnose, treat, cure, or prevent any disease.